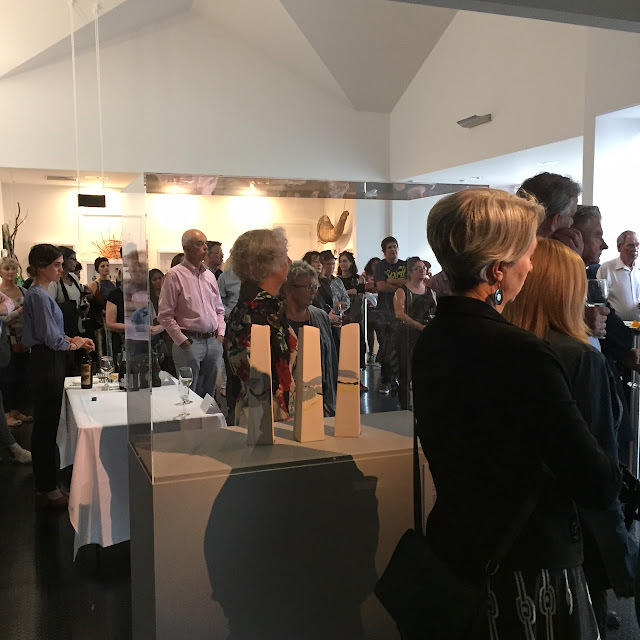 On Friday evening, March 24, we celebrated the official opening of From the Bower: patterns of collecting at Warrnambool Art Gallery. 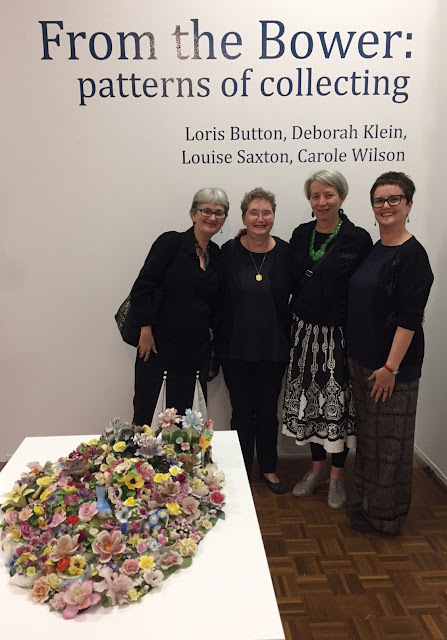 It was immensely gratifying to see the combined efforts of Loris Button, Carole Wilson, Louise Saxton and myself come to fruition at long last. 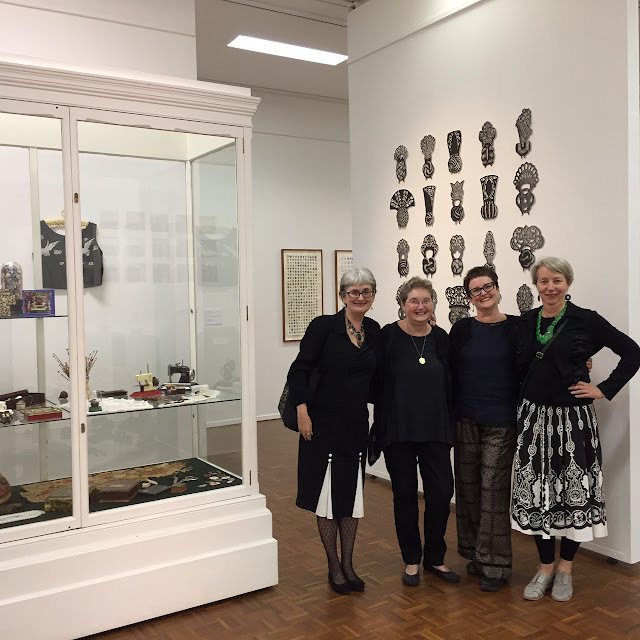 The exhibition was launched by the Lady Mayoress of Warrnambool, Cr Kylie Gaston (second from right). 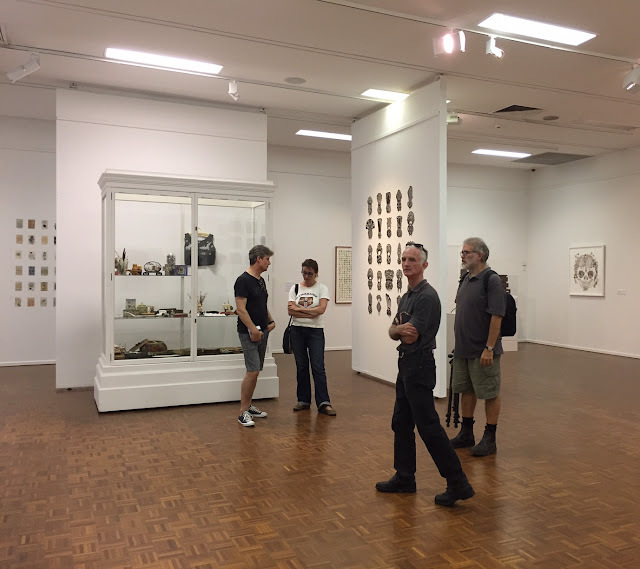 On the far right is Acting Director of Warrnambool Art Gallery, Murray Bowes. 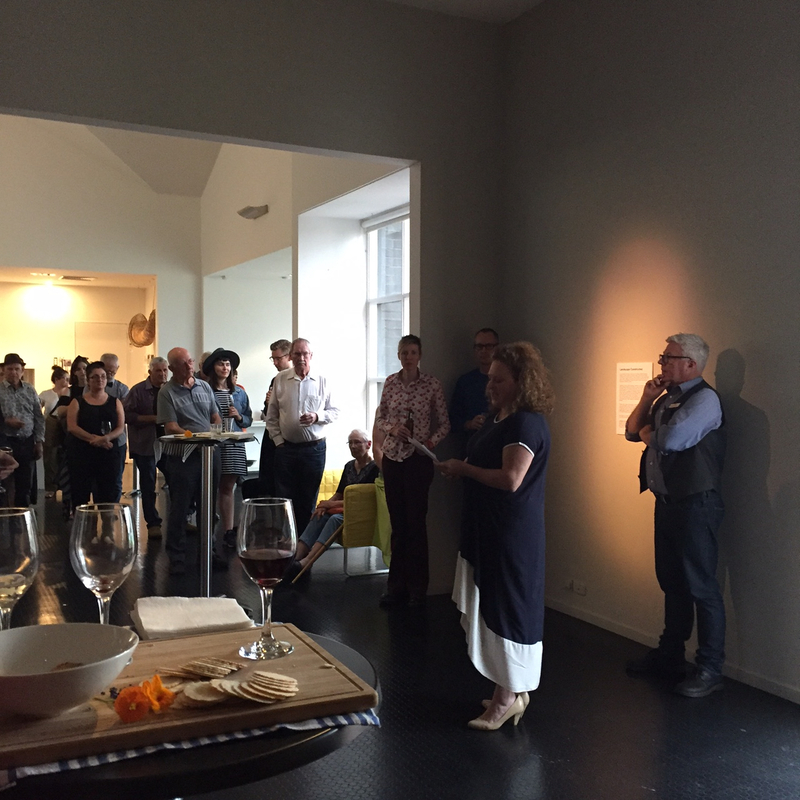 - along with Carole Wilson (below, far right) and the rest of the opening night crowd. 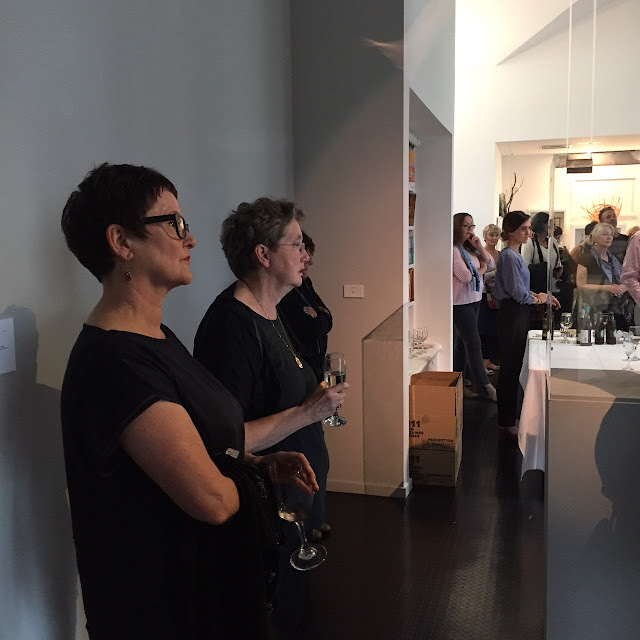 Directly after the speeches, Carole asked Tim Gresham to take some snapshots of the Bowerbirds as a memento of the exhibition launch. The following three photos are by Tim. 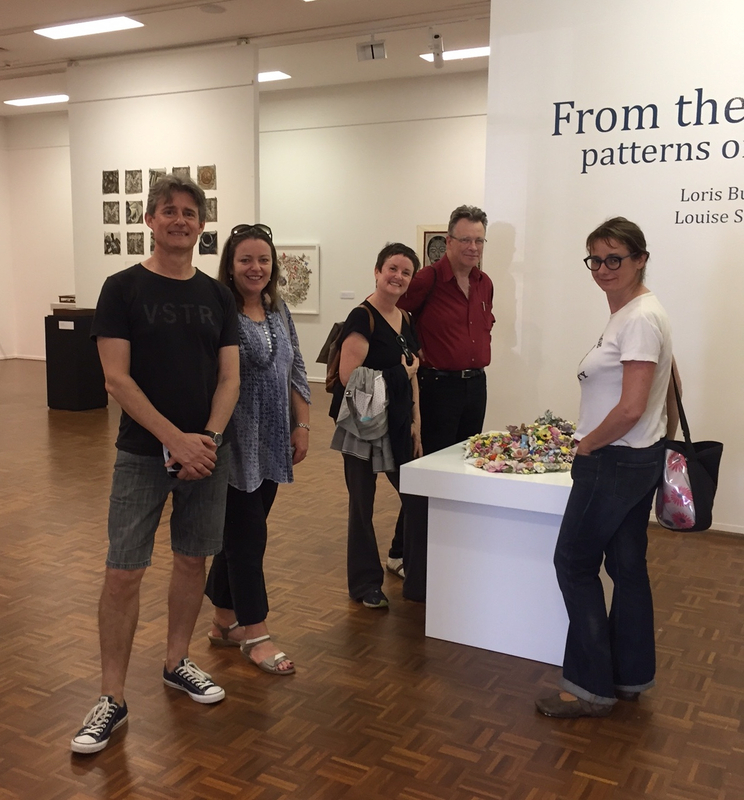 Directly below, L - R, are myself, Loris Button, Carole Wilson and Louise Saxton. In the foreground is Louise's Porcelain Garden. 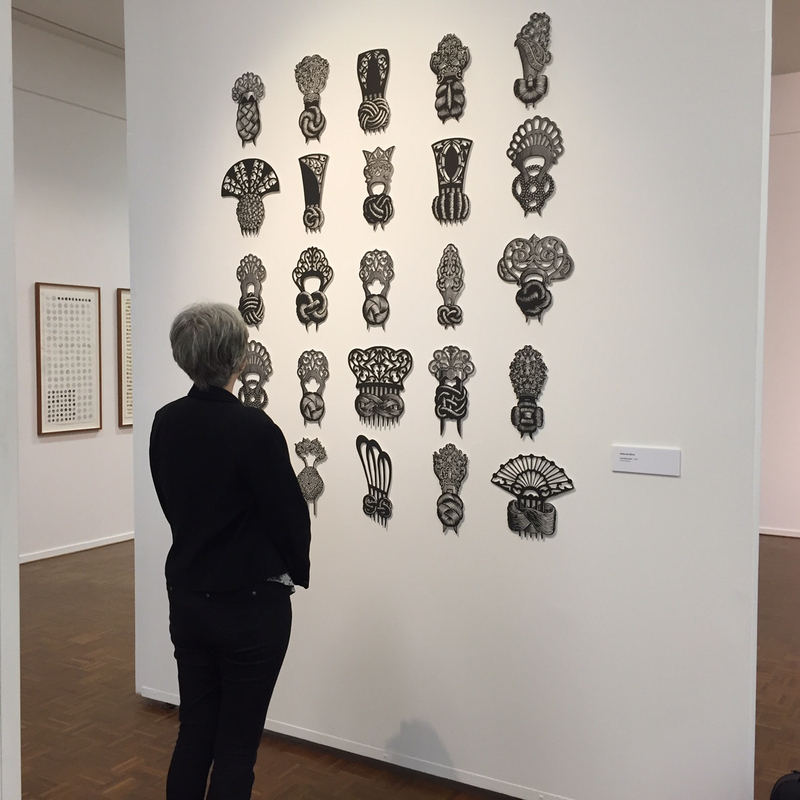 Below, we stand in front of my linocut installation, Iron Butterflies. 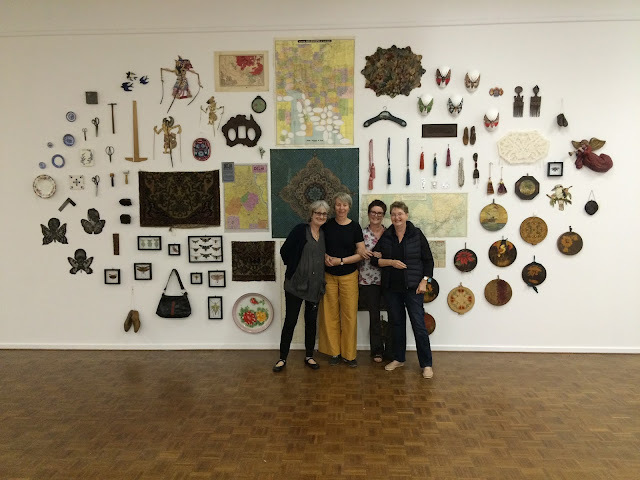 In the background, centre, are collages by Carole Wilson. The last time we stood in front of our combined collections wall, it had just been installed by Carole and Shane (see last post). 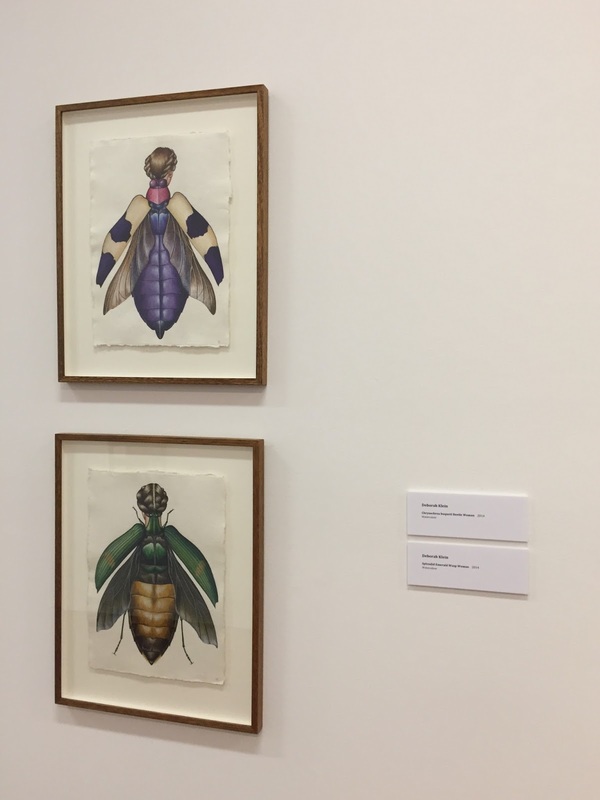 Directly below, Shane Jones views two of my Homo-insecta watercolours. 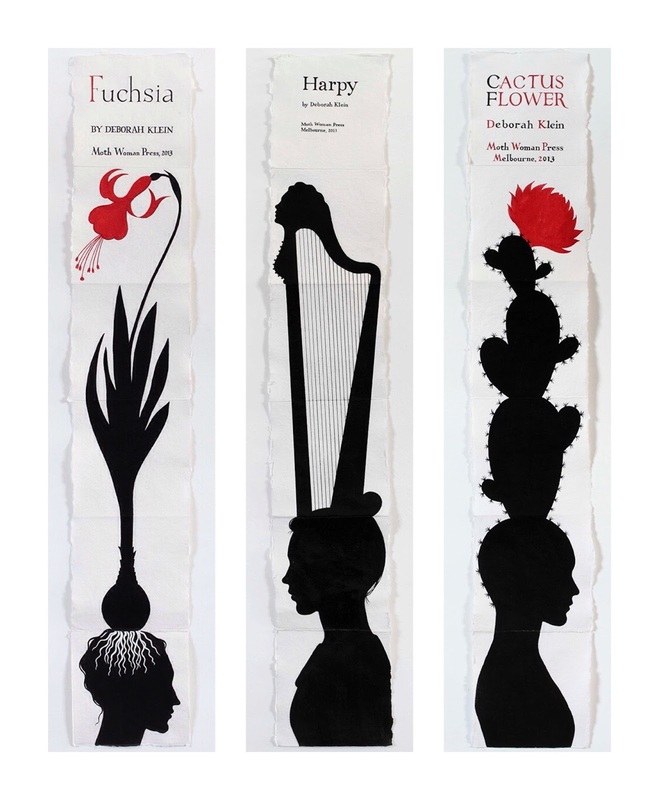 To their right is a triptych by Carole Wilson. The following morning, Tim Gresham documented the show. While he worked, Gaye Britt (pictured below), Kathryn Ryan, Paul Logsdon, Shane and I and took the opportunity to view the show again, minus the previous evening's crowd. Nevertheless, there was a steady stream of visitors the whole time we were there. 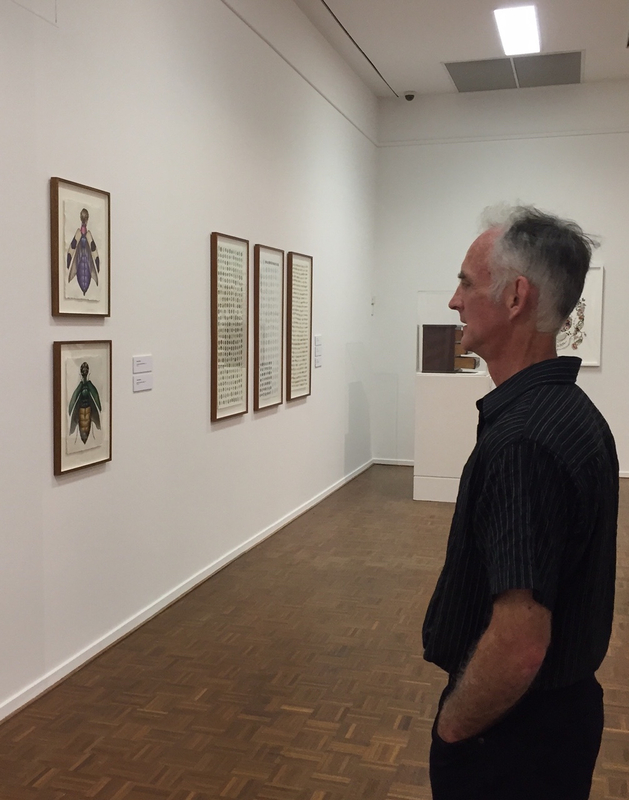 Meanwhile, Louise Saxton and her husband, Colin, also called in for a second look at the show. 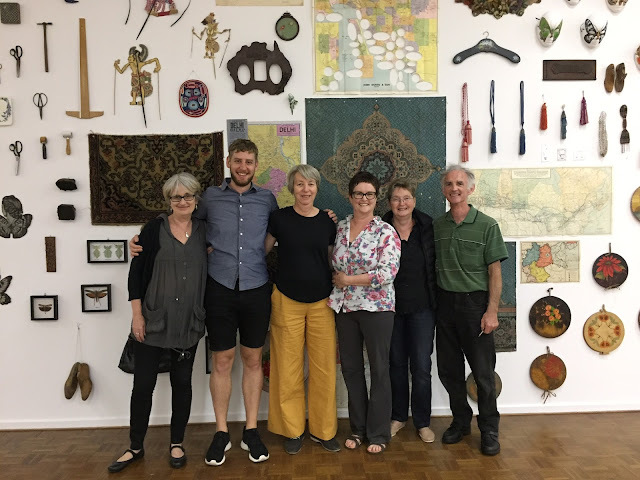 Pictured below, L - R: Paul Logsdon, Kathryn Ryan, Louise, Colin and Gaye Britt. Below: Paul Logsdon and Shane Jones. Artworks and collection objects are mine, Loris Button's and Louise Saxton's. After opening night and the many lovely people we met, for Shane and I, the greatest pleasure of our long weekend at Warrnambool was spending quality time with old friends. 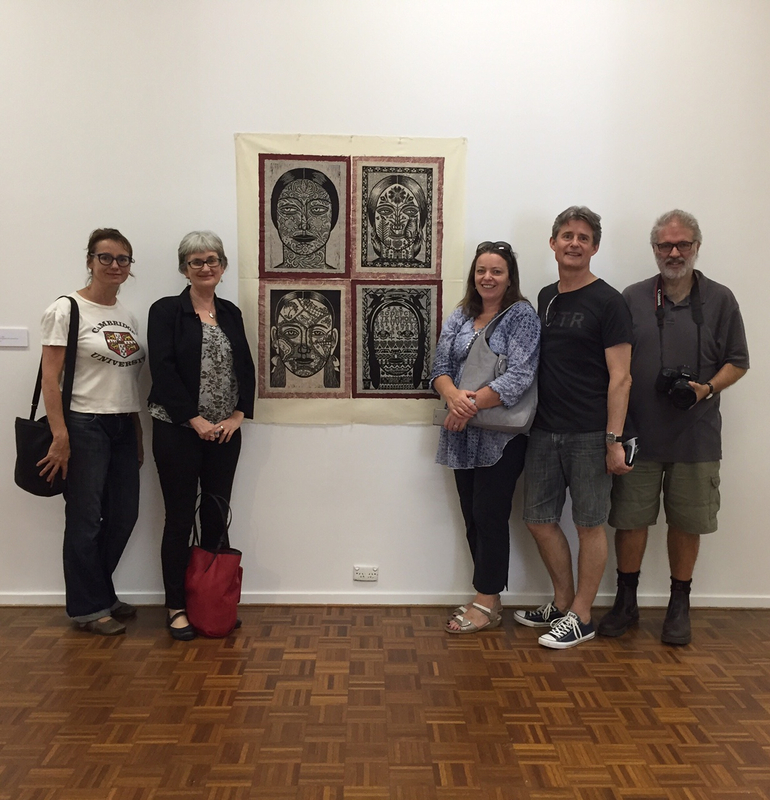 From left, flanking my Tattooed Faces Sampler (1997) are Gaye Britt, myself, Kathryn Ryan, Paul Logsdon and Tim Gresham. Photo credit: Shane Jones. Shane also took the following two shots. Directly below, I'm checking out my Iron Butterflies, an installation of cut out linocuts. - then taking a closer look at the combined collections installation, which includes selections from my hair ornament, insect, lino block, mask and shadow puppet collections. Below, Tim sets up another shot. 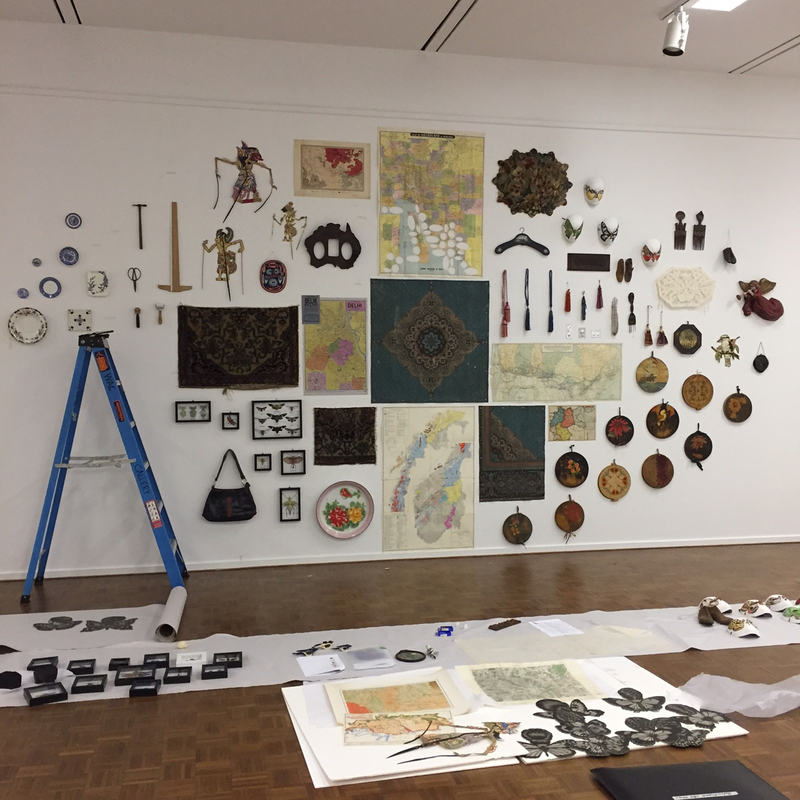 On the far wall are three of Carole Wilson's artworks and on the partition, far right, is a shadow box containing objects from the collection of Loris Button. Below, from right: Three collages by Carole Wilson and an installation view of my Cabinet of Moth Masks. A lively group of students arrived. 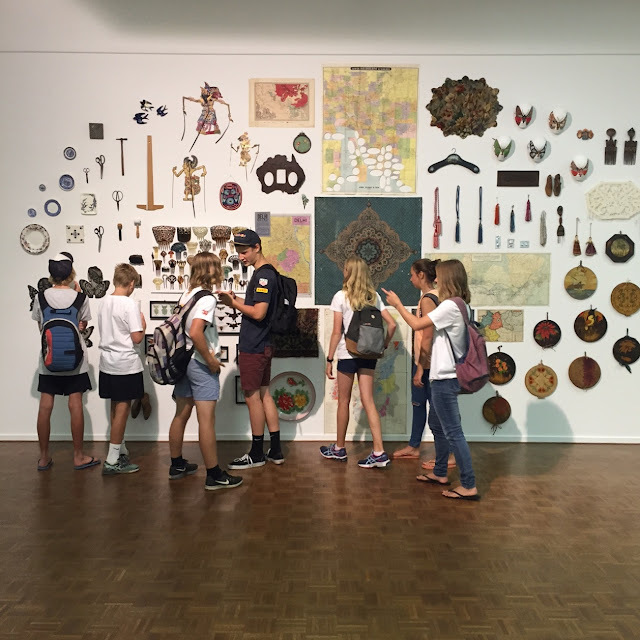 They were particularly engaged with the combined collections wall. L - R below: Paul, Gaye, Shane and Tim. 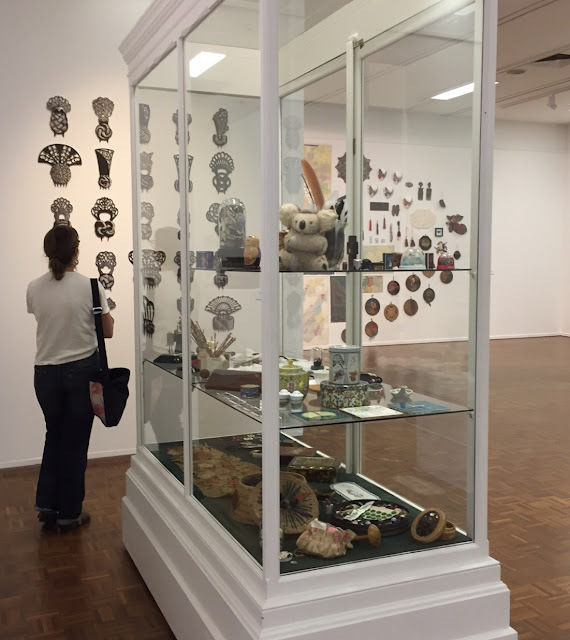 Below: an installation view of collection items of Loris Button and Louise Saxton (L - R). Second from right are artworks by Loris Button (part of her Travelling Tales). On the far right are my Homo-insecta watercolours. 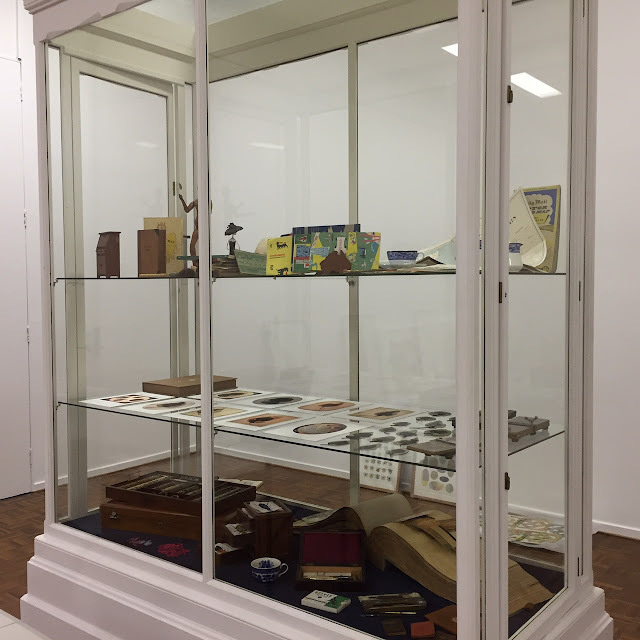 A detail from one of the large vitrines, containing collection items from all the artists. 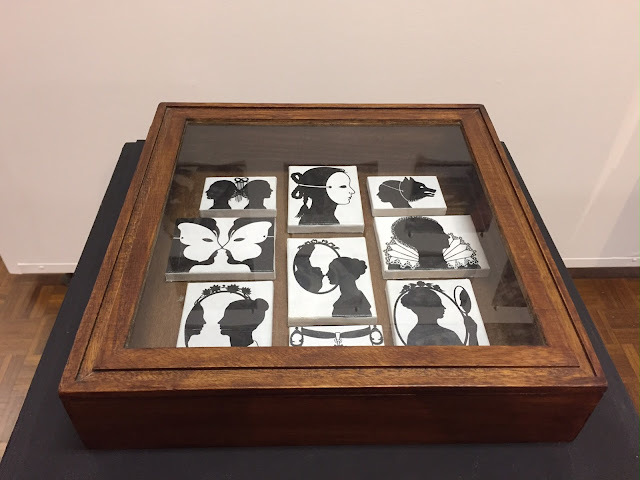 - and Vignette Vitrine, a box box of Shadow Women. 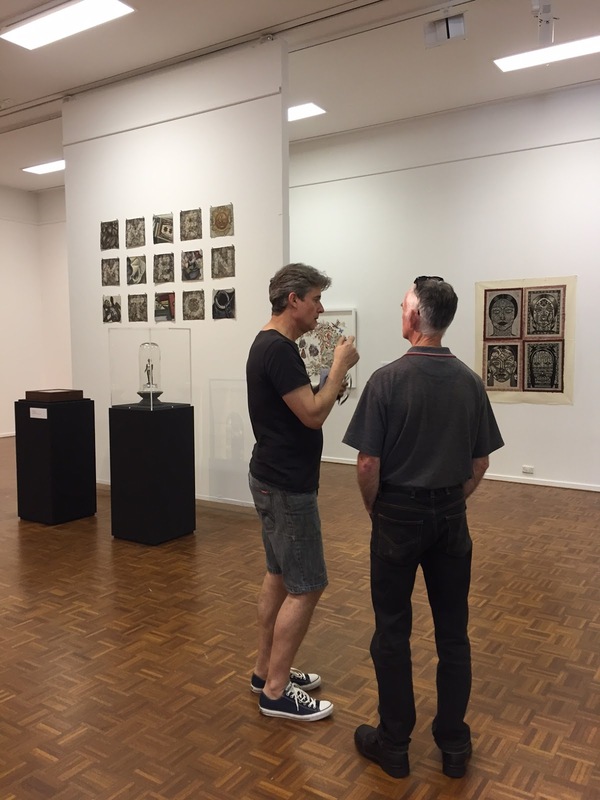 Tim Gresham's installation views will be featured in the near future. 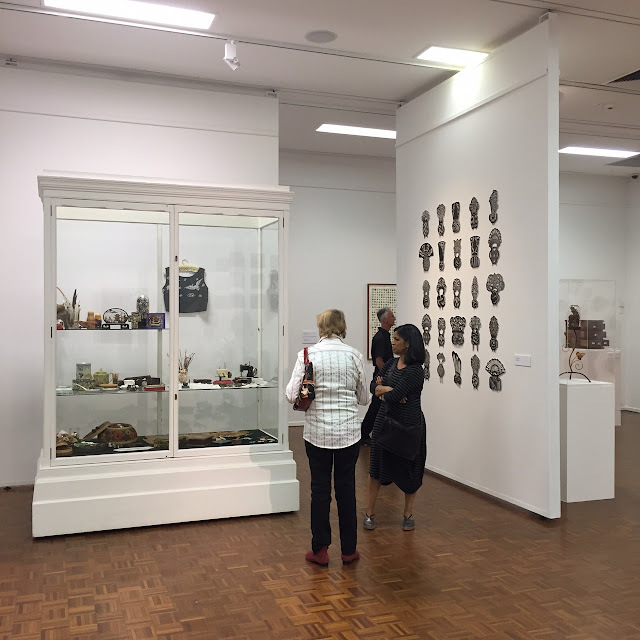 From the Bower continues until 12 June. For details of opening times, scroll to the end of the last post or go HERE. 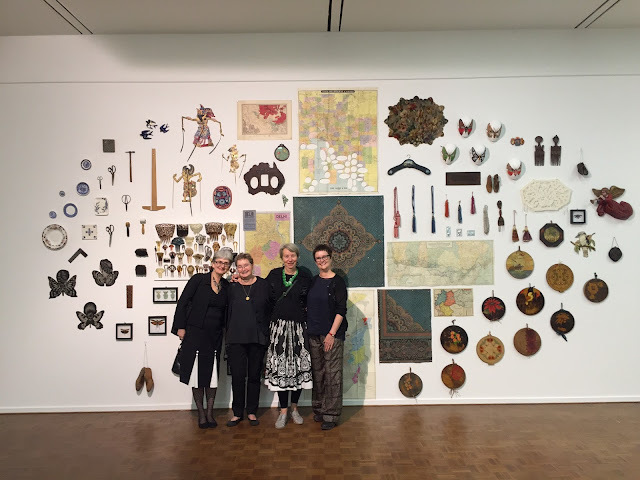 Pictured above: four happy artists, L - R: myself, Carole Wilson, Louise Saxton and Loris Button, snapped last Thursday on Day 2 of the installation of From the Bower - patterns of collecting at Warrnambool Art Gallery. 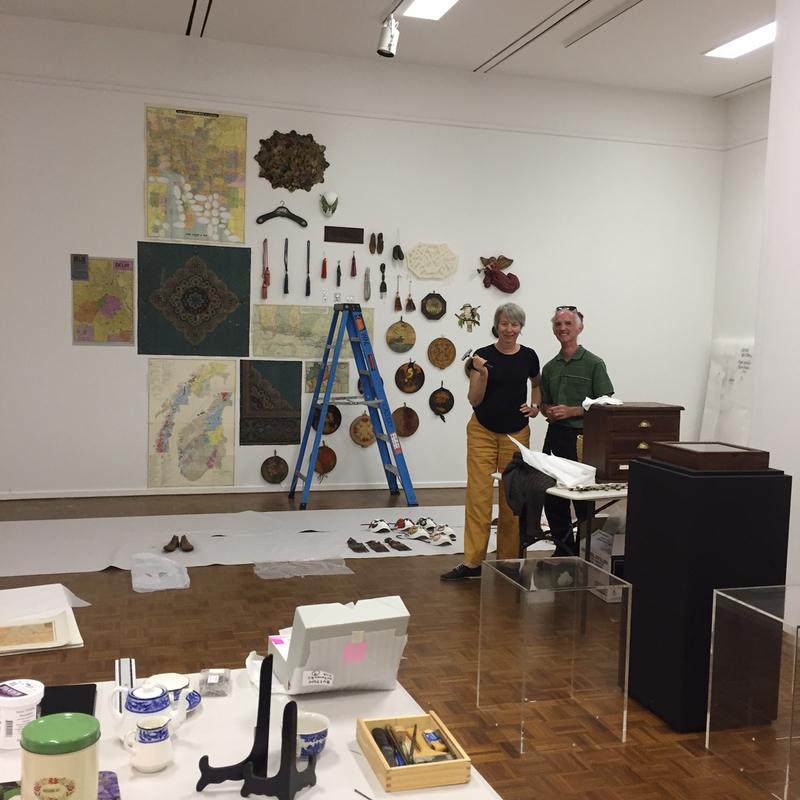 Behind us is the exhibition's centrepiece, a huge wall work combining aspects of our private collections, constructed with consummate skill by Carole Wilson and Shane Jones. Directly below are some progress views of the install taken earlier in the day. As Carole and Shane beavered away on the wall work, Loris, Louise and I set about arranging additional collection objects and artworks in one of two large display cabinets. 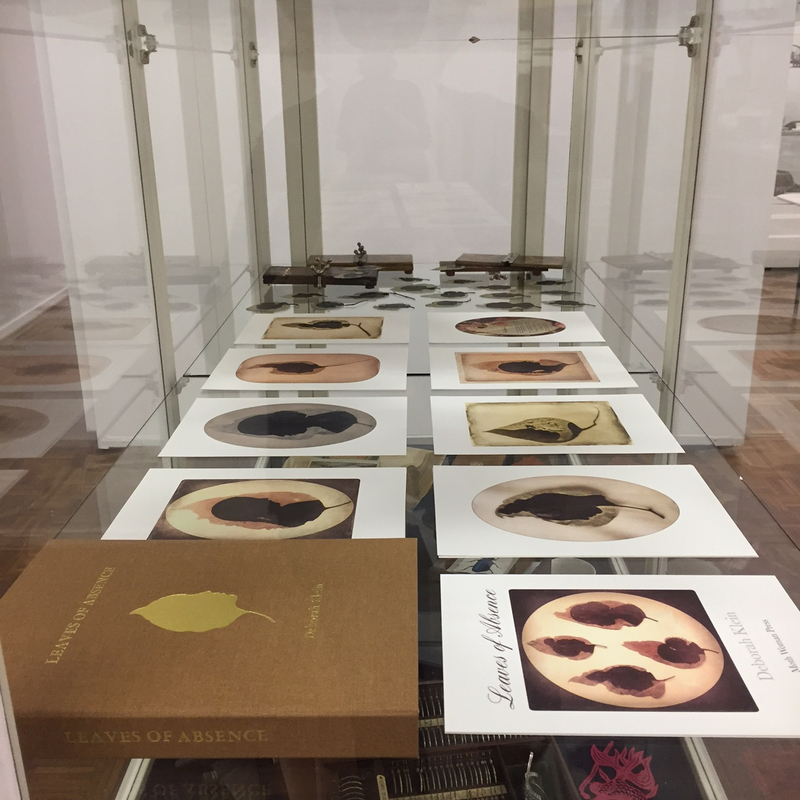 On the middle shelf above and below, pages of my unbound artist book, Leaves of Absence, are paired with the hand painted Eucalyptus leaves that were the basis for the artwork, together with the antique flower presses in which the leaves were pressed and dried. 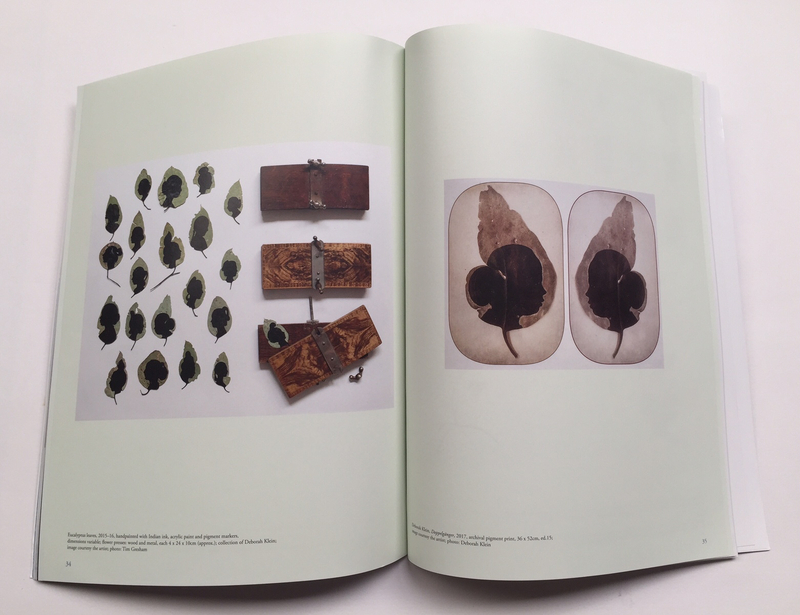 On the shelf beneath Leaves of Absence are tantalising glimpses of objects from the collections of Louise Saxton, Loris Button, Carole Wilson and myself, including one of my personal favourites, Loris's book of art deco wallpaper samples. Below: A still life on the top shelf. 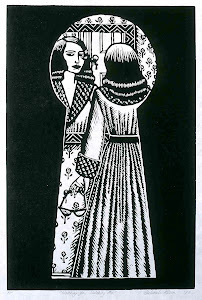 The mannikin was a gift from my late mother when I was budding teenage artist. Needless to add, I've owned it for a very long time! 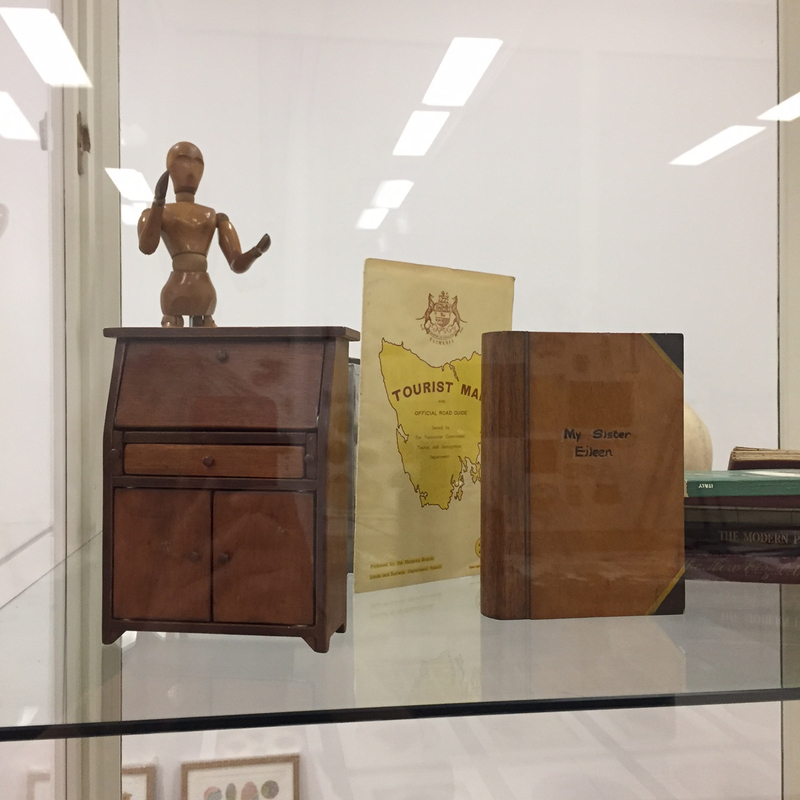 The miniature desk, doubtless an apprentice piece, was discovered at an antique market in Daylesford. The faux book, which has a secret compartment, was made by my late father as a gift for his sister, my Aunt Eileen. 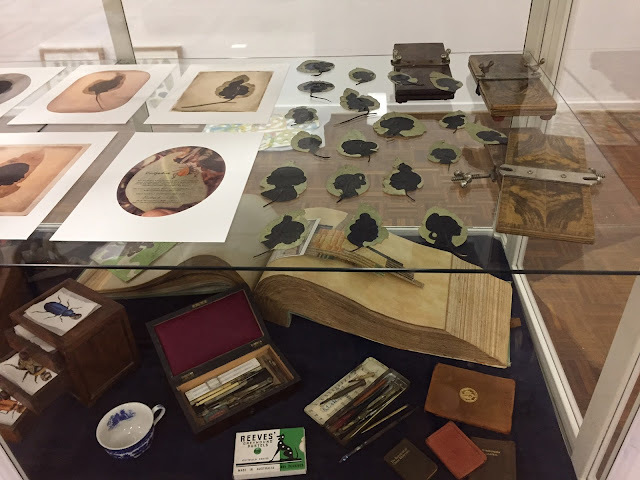 The vintage map and antique books are from the collection of Carole Wilson. More of Carole's map collection can be seen in the view below. 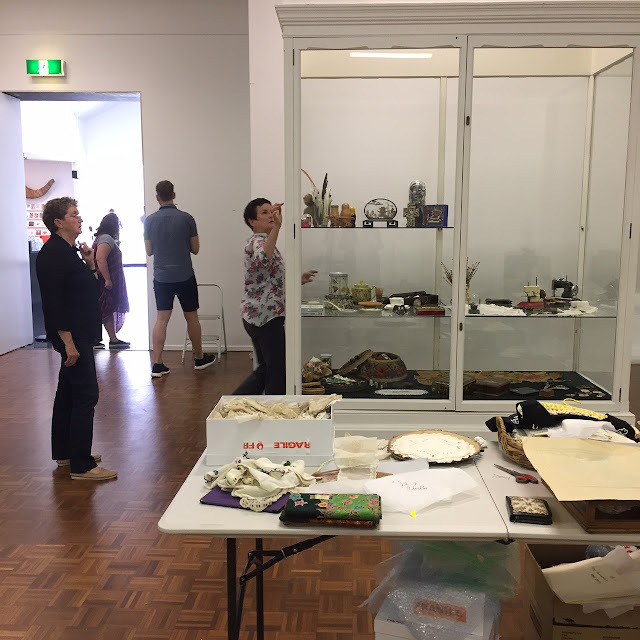 Loris and Louise did a magnificent job of installing other collection items, most of them relating to the domestic realm, in the second vitrine. 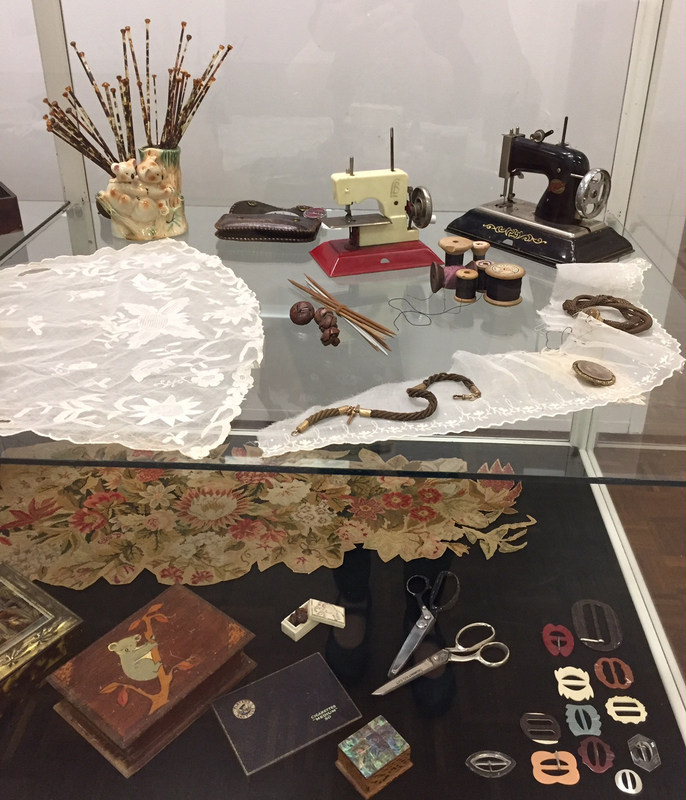 I'm particularly enamoured of Carole's miniature sewing machines (middle shelf, far right). Below is a detail of the finished display. The raffia sewing basket on the bottom shelf belonged to my mother. 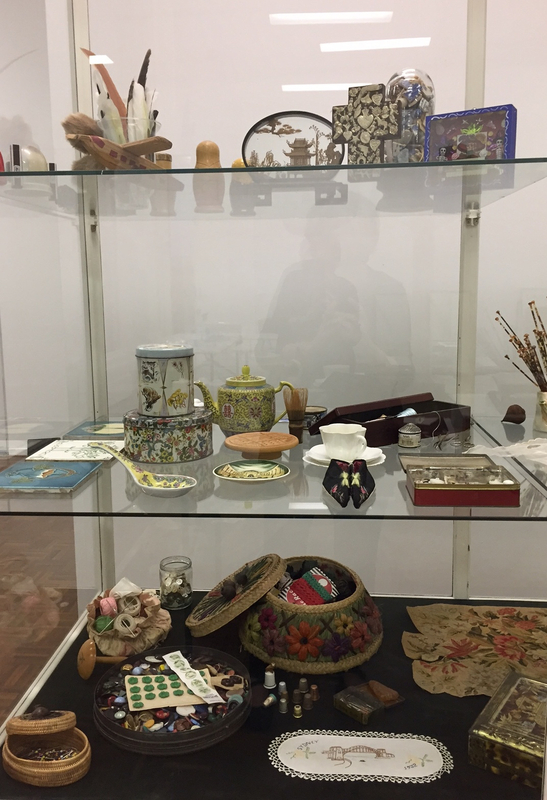 The remainder of needlework-related objects in this view are from the collections of Loris and Louise. 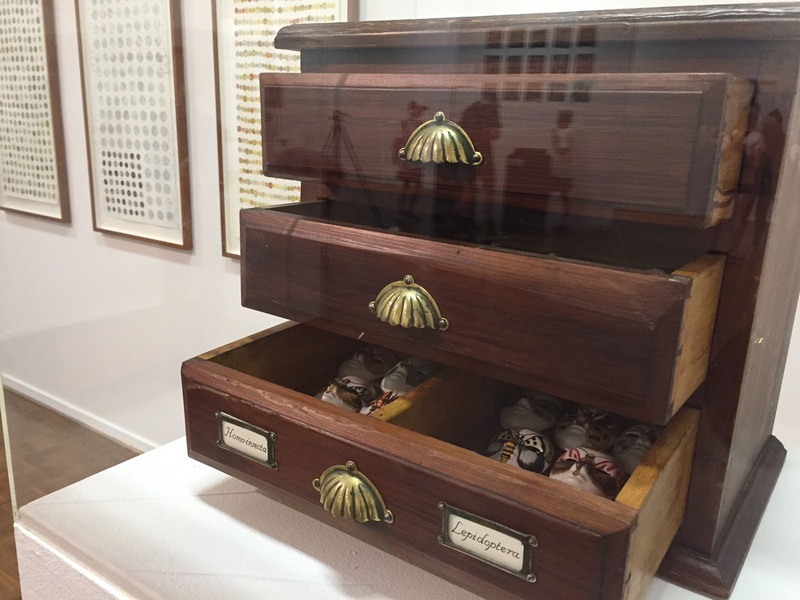 Personal favourites include Loris's film canister containing buttons from four generations of her family and Louise's Sydney Harbour Bridge commemorative d'oyley (bottom row front, second and third from left). 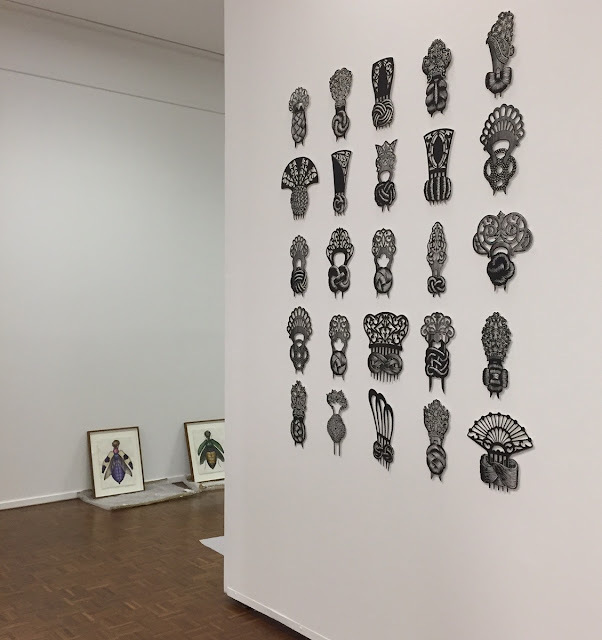 Iron Butterflies (directly below) is a suite of linocuts inspired by my collection of antique hair ornaments, a number of which are also in the show. Agostina Hawkins, WAG's Curator of Collections, painstakingly installed the work. Meanwhile, on the far left, two Homo-insecta watercolours wait patiently in the wings. The multi-faceted exhibition that is From the Bower took three days to install. 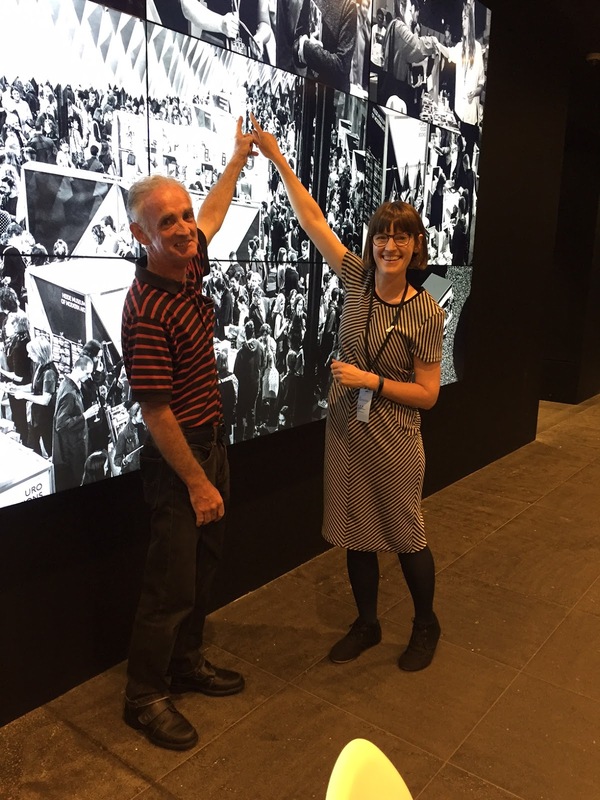 I had to leave at the end of the second day in order to prepare for the Australian Zine Showcase at NGV International (see previous post) so I haven't yet seen the completed installation. 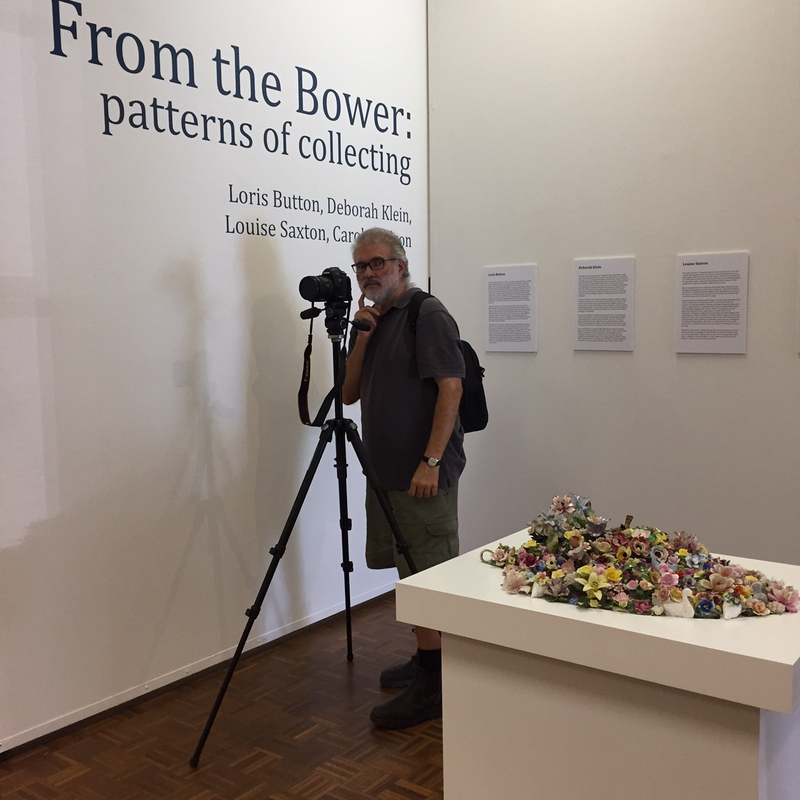 If the photographs sent to me by fellow Bowerbirds and messages from those who've already seen the show are anything to go by, however, it's all come together beautifully. 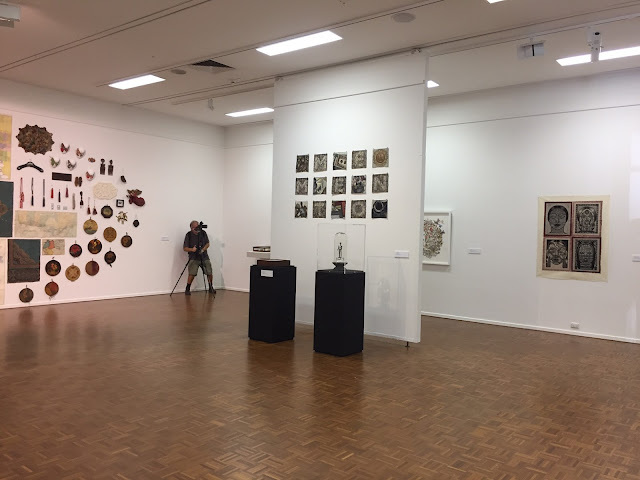 From the Bower opened to the public on Saturday, 18 March. 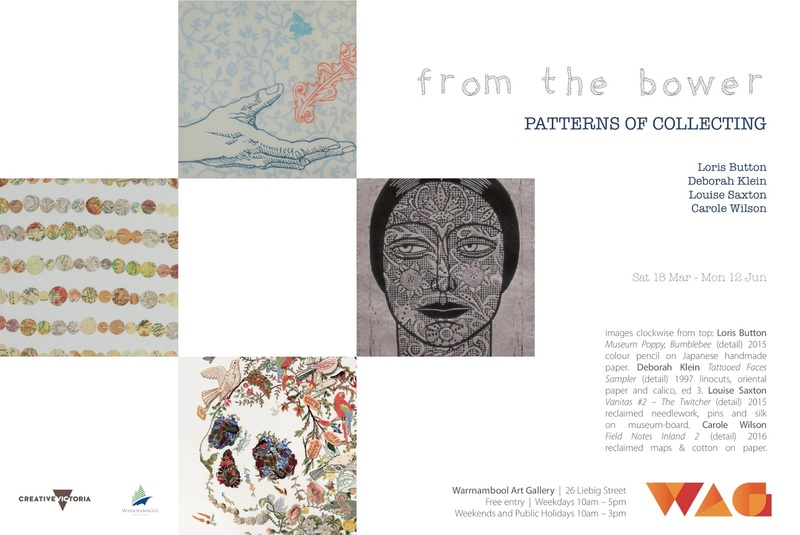 Opening night is this coming Friday, 24 March, from 6 pm. If you're in town, do come in and join us for a celebratory glass of wine. 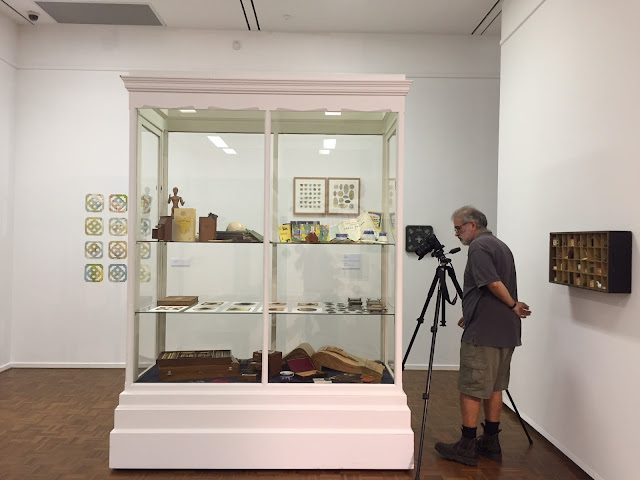 The exhibition runs until Monday, 12 June. 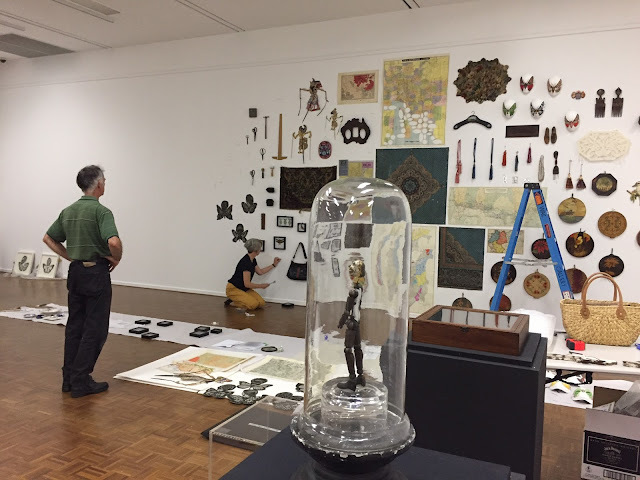 From the Bower - patterns of collecting will travel to the Art Gallery of Ballarat, where it will run from 29 July - 17 September. 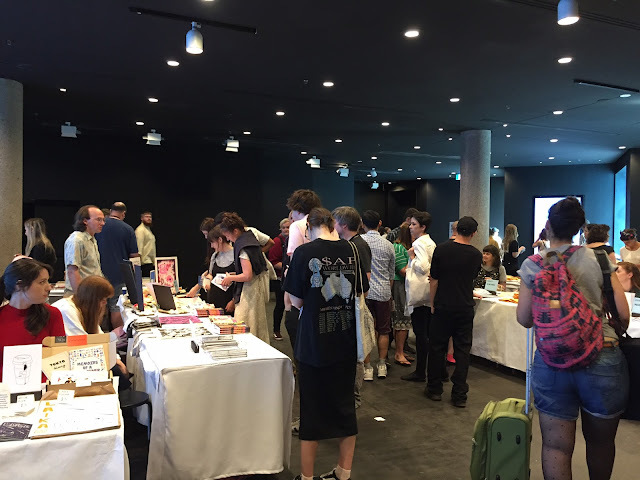 followed by a wider view of the Australian Zine Showcase. 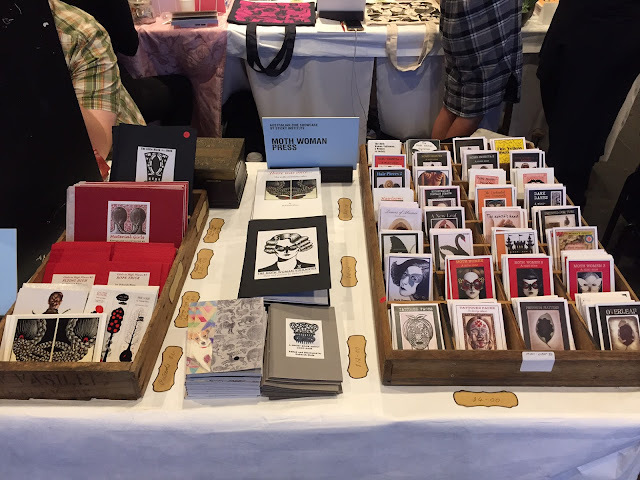 Due to the number of participants, Moth Woman Press was relegated to a half table, but we were pleased with the final result. Some of the day's greatest pleasures were provided by visits from friends, some old, some new. Below on the righthand side is one of the former, Louise Jennison, mugging with my indispensable assistant, Shane Jones. Louise is one half of the team of artist book makers, Gracia and Louise, who are showing their books and zines in the Melbourne Art Book Fair. She and Shane are pointing to the location of their stand in the Great Hall. 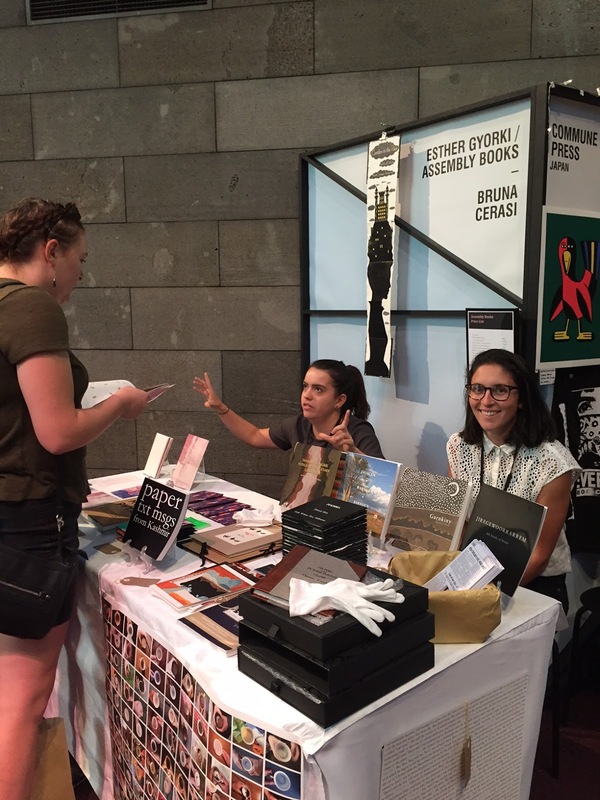 In the Great Hall, Moth Woman Press is represented by Esther Gyorki (pictured right) at Assembly Books. 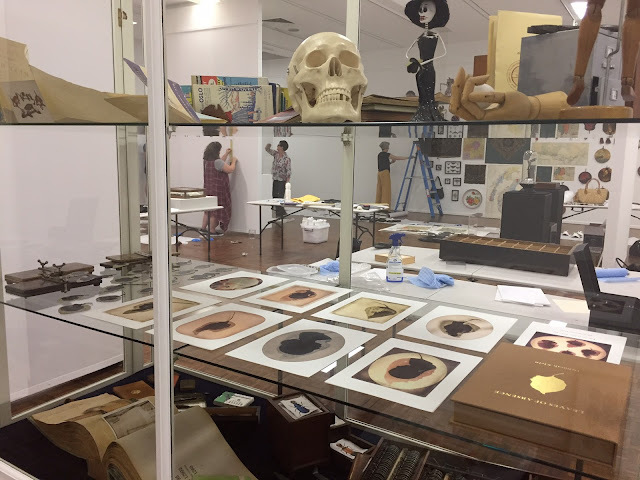 My artist book, Castles in the Hair (2013) hangs open, next to the Assembly Books sign. 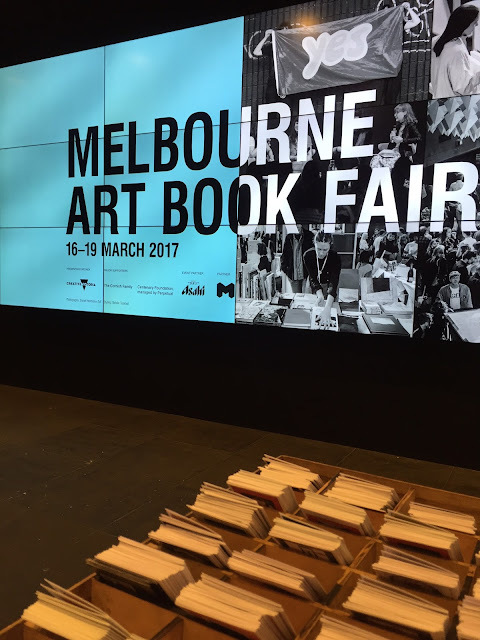 The Melbourne Art Book Fair opened on Friday, 16 March and ends at 5 pm today. For more views of the book and zine fairs, visit Moth Woman Press. This morning I'm heading off to Warrnambool Art Gallery to meet up with fellow artists, Loris Button, Carole Wilson and Louise Saxton, to begin the hang of our long-planned exhibition, From the Bower - patterns of collecting. Loading the car will be a job of work. Shane is convinced it will all fit; I'm not so sure... Currently our hallway looks like the warehouse scene at the end of Orson Welles's Citizen Kane (all that's missing is Rosebud) and some of the boxes have also started to colonise the living room. From the Bower opens on 18 March (see also previous post). For more about the show, go HERE. 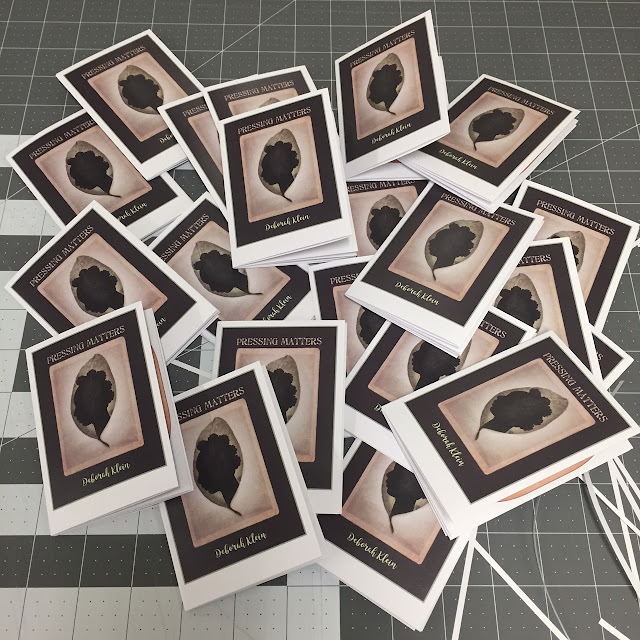 Meanwhile, it's also been a hive of activity at Moth Woman Press. We've been working on two new zines for the Sticky Institute Australian Zine Showcase that will be running concurrently with the Melbourne Art Book Fair at NGV International, National Gallery of Victoria. 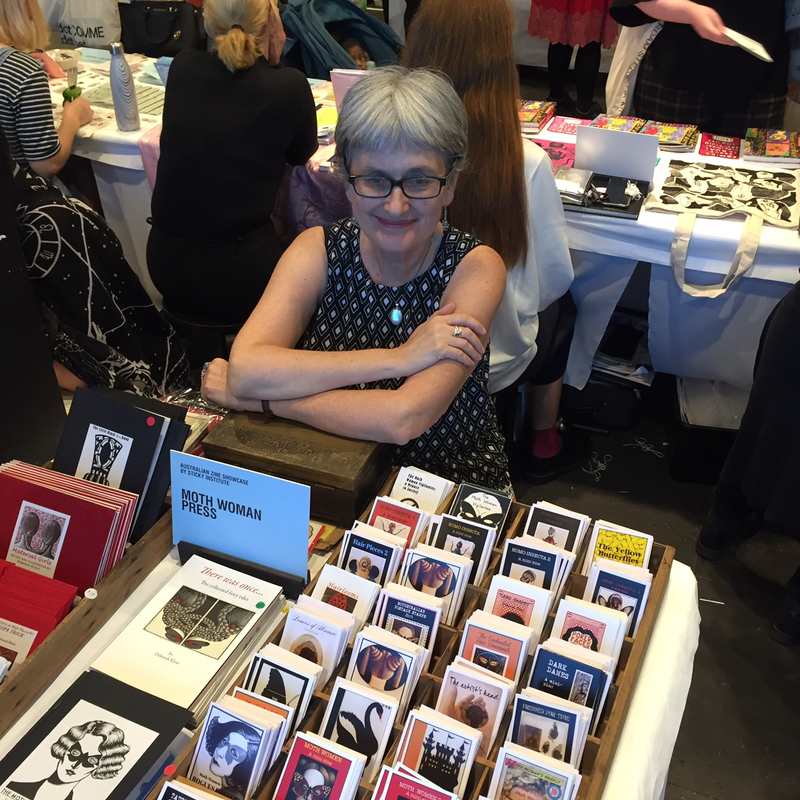 Moth Woman Press is part of that too; our books will be represented by Esther Gyorki at Assembly Books. For progress views of the new zines, go HERE and HERE. For more about the MWP publications that will be shown by Assembly Books, go HERE. The Melbourne Art Book Fair runs from 16 - 19 March. The website is HERE. I'll be presenting a selection of Moth Woman Press zines at the Sticky Institute Australian Zine Showcase at NGV International on Saturday, 18 March from 2.30 - 8 pm. Sticky's website is HERE. 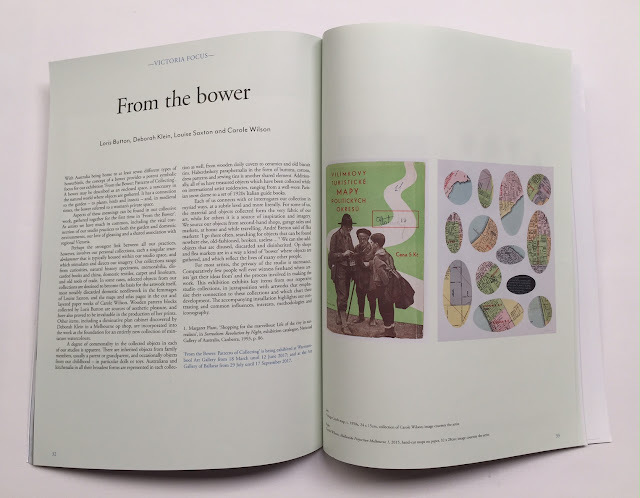 The current issue of ART MONTHLY AUSTRALASIA (Issue 296/March, 2017) focuses on Victorian-based artists and galleries. 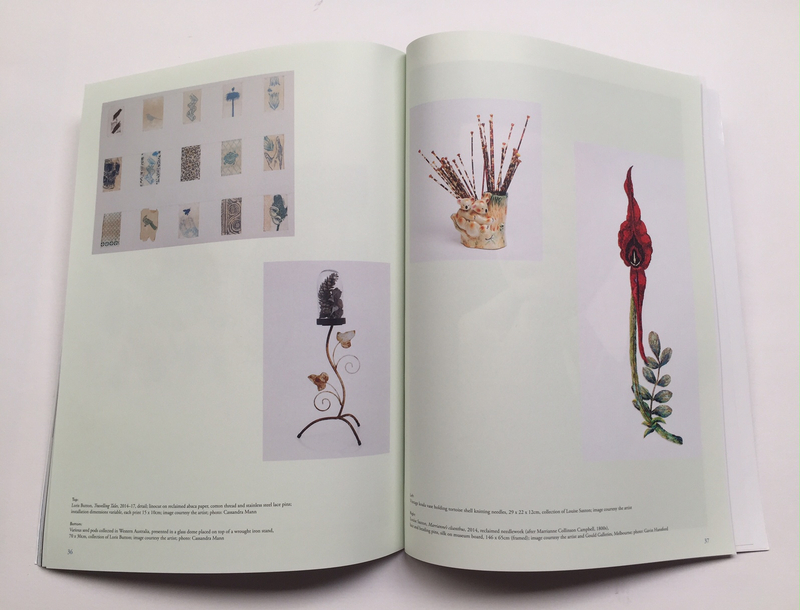 It includes a lavish six-page spread on From the Bower: patterns of collecting, an upcoming show comprising the private collections and related artworks of Louise Saxton, Carole Wilson, Loris Button and myself (see also previous post). 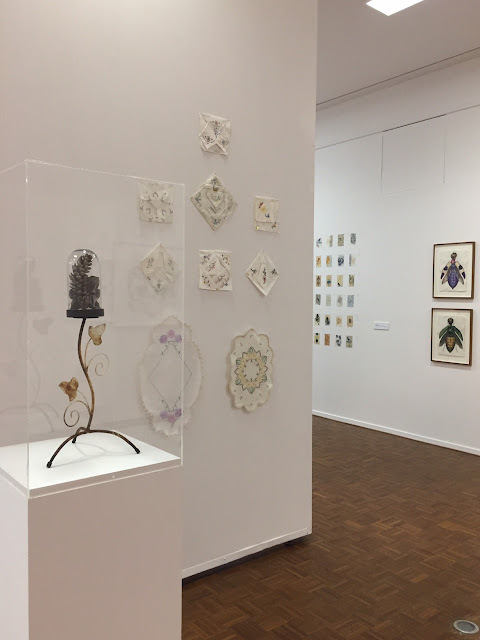 From the Bower: patterns of collecting opens at Warrnambool Art Gallery on 18 March and continues until 12 June, then travels to the Art Gallery of Ballarat, where it will run from 29 July - 17 September, 2017. Click on individual images for a clearer view. From the Bower: patterns of collecting is an exhibition presenting artwork and items from the unique personal collections of four contemporary Victorian artists, Loris Button, Deborah Klein, Louise Saxton and Carole Wilson. 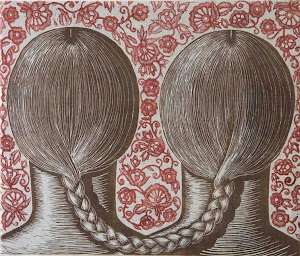 The artists are linked by their studio practice, their appreciation of textiles and traditional sewing crafts, their regional locations and connections, and their love of gleaning. 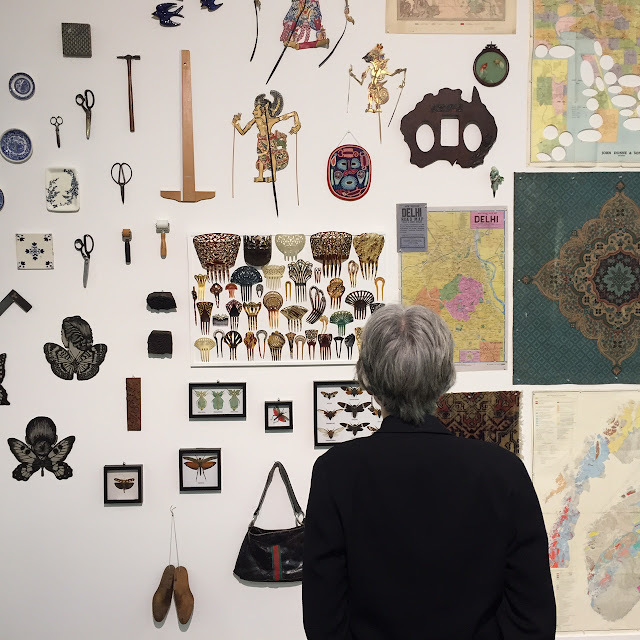 Their studio collections range from domestic textiles and sewing paraphernalia, curiosities, natural history specimens, memorabilia, discarded books and china, carpet and linoleum, and old tools of trade. In this exhibition a portion of each artist’s studio collection is gathered, in an engaging and dynamic installation, alongside works by the artists which respond directly and/or relate to, their greater collection. 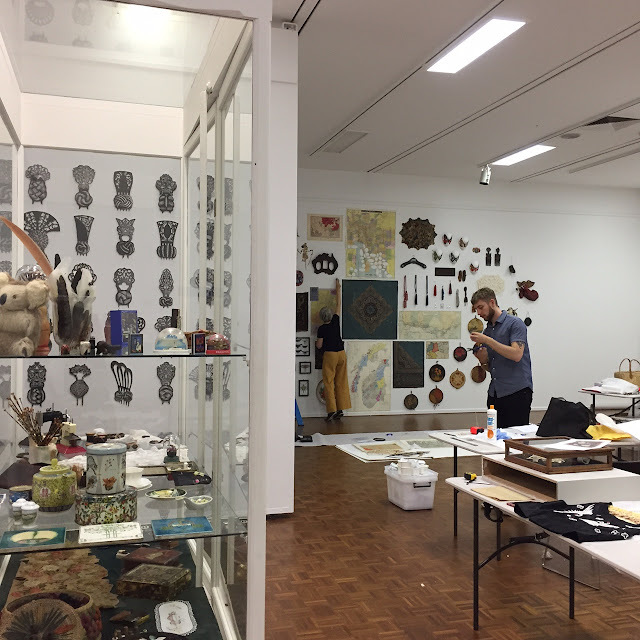 The exhibition draws these individual artists together into one large ‘bower’ and creates a space in which the private becomes public. It allows the viewer to reflect upon the process of collecting, gathering and making, in the practice of these four artists. From the Bower: patterns of collecting will travel to the Art Gallery of Ballarat, where it will run from 29 July - 17 September.